Seattle looked lethargic in the high heat and humidity of Kansas City, losing 3-0 to Sporting KC for its 12th loss of the season. Sunday was one of those rare treats for sports fans, the chance to see a team achieve something never done before. Unfortunately for fans of the the Seattle Sounders, that feat was watching the club become the first team in MLS history to finish a match without recording a shot. The Sounders avoided the anti-perfect game thanks to an 88th-minute effort by Joevin Jones that rolled six yards wide of the net. They were outclassed in every regard by Sporting Kansas City in a 3-0 loss. A heat index of 106 degrees, defensive lapses, and a goal just before halftime were the ingredients thrown into The Cauldron at Children’s Mercy Park that resulted in Seattle’s foulest brew of the season. 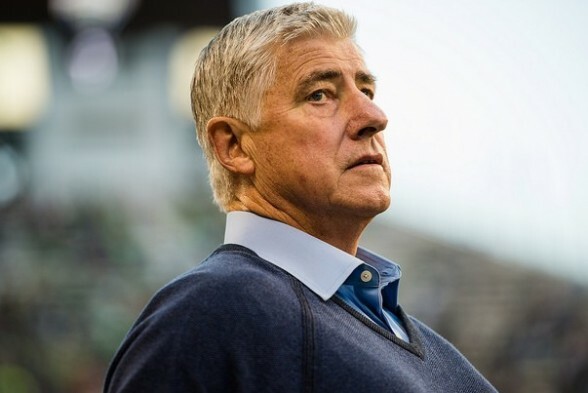 Coach Sigi Schmid didn’t mince words after the game. Schmid allowed that the weather affected his team, but pointed out the Kansas City performed well in the same conditions. By Schmid’s logic, things started feeling very hot for the Sounders from the opening whistle. The team was swamped in the midfield, and struggled to connect its passes. Kansas City (9-10-4) strolled to the lead in the 21st minute, when Dom Dwyer ran right behind Brad Evans and got his head to an open-play cross from Roger Espinoza for an easy goal. Just as it looked as if Seattle (6-12-2) might trail by only a goal at the intermission, Jacob Peterson doubled the advantage in the third minute of stoppage time in the first half, connecting with a cutback cross from Saad Abdul-Salam and shooting it across the goal into the upper left corner. At the start of the second half, Schmid subbed on center backs Tony Alfaro and Zach Scott, pushing Evans into the midfield while Chad Marshall remained the defensive centerpiece. The move failed to generate more than a moment’s worth of momentum for Seattle, who spent the majority of the second half in its own end, and seemed to lack the energy to put much pressure on Kansas City’s players. The final goal came in the 79th minute, when a back pass from Scott seemed to linger in space between Tyrone Mears and Marshall. Neither made a move for the ball, allowing Dwyer to pick it up and convert the ball past Stefan Frei for his second goal of the game. The error by Scott was his second in a week. His failed back pass against Los Angeles gave up the game-tying goal in Wednesday’s loss. From there, SKC poured on the pressure. Only a series of stops from Frei kept the score from becoming more lopsided, with the shot from Jones coming on a counterattack after Kansas City committed numbers forward. Schmid said his team ran out of gas late, contributing to the defensive collapse. “At that time point in the game, you start dragging a little bit, and guys didn’t make their runs and didn’t make their cover,” he said. “Towards the end, we were a beat team, and I thought they were really trying to pour it on. Seattle has lost a league-worst 12 games through 20 matches, one loss fewer than the 13 total losses the team accrued in all of 2015. There may be a way out of the pit of sluggish despair whence Seattle has descended, but the team failed to show that it knows which way to climb to get its season back on track. Ichiro never liked playing KC during the height of summer. His quote can’t be repeated here but it can be found on YouTube when he was interviewed by Bob Costas. Something about two rats and a wool sock. That being said even the crowd looked like they were struggling. The only ones who weren’t were Sporting Kansas City. It would take a 1977-1978 SuperSonics-like turn around at this point for the Sounders to save their season and if they did at this point I don’t know if they’d have enough in the tank for any sort of playoff run. It would be interesting to hear behind closed doors if the Sounders brain trust expected this. This team is showing its age at some positions but also inexperience at others. Playing for pride now. I like the funny video above entitled, “highlights”. Time for a #schmexit. I think the X-Box boys have cashed it in. I think that’s on Schmidt…Schmexit it should be.